Street Criminals are NPCs that do trivial crimes like stealing vehicles or pickpocketing pedestrians. They have been featured in the series since Grand Theft Auto 2. They create a more "complete" environment in the city by simulating typical street crimes. The street criminals in GTA 2 come in two varieties; car thieves and pickpockets. The car thieves wear a green shirt and will usually steal any civilian or gang car that they can access, including the player's vehicle. Although the police make no attempts to stop car thieves, if a gang car is stolen, nearby gang members will open fire or chase the stolen vehicle. They will usually abandon the vehicle after a few minutes and run off to steal another. The pickpockets, on the other hand, are distinguished by their red short-sleeve shirt shirt and white undershirt. They will steal money from anyone on the street, including gang members and the player - usually uttering the phrase "Gi'me your wallet!". Unlike the car thieves, if an on-foot police officer sees them committing crime, they will chase after them. Gang members also don't take kindly to being pick-pocketed and will usually open fire on the thief. The criminals in GTA III come in two varieties. One of the criminals look strikingly similar to members of the Southside Hoods, except that they wear a brown jacket, as opposed to the Hoods' red or purple jackets. The other criminal wears a hat, a black shirt with white sleeves, and blue "camo" shorts. Much like in GTA 2, they will steal any civilian or gang vehicle that they can access, including the player's vehicle. They can also be seen pickpocketing pedestrians - who usually run away or chase/fight them. If targeted with a gun when escaping from victims, they will drop money. An officer can occasionally be seen chasing someone on foot, when he catches up to the NPC he will try to attack him/her. The criminals in GTA San Andreas come in a total of nine different types: three each of three different races (white, black and Hispanic), with each city having one criminal of one race each. There are three different criminals in Los Santos: the first is black and wears a blue striped t-shirt, dark green shorts and a chain, and according to his dialogue has previously spent time in prison; the second is Hispanic and wears a brownish-tan jacket over a white shirt, beige jeans, sunglasses and a chain that features a cross; and the third is a white biker and wears a dark gray short-sleeve jacket and sunglasses. They will try to steal any vehicle, including the player's vehicle, however, they will not steal police cars, police motorcycles, or any other law enforcement vehicle. They may sometimes have hidden weapons, such as a knife or a pistol. Like in GTA Vice City, if a police officer sees them stealing cars, they will attempt to stop them. Unfortunately, the player no longer receives a "Good Citizen Bonus" for helping the officer, in fact, the player is more likely to attain a wanted level by doing so. Drug Dealers can also be seen throughout San Andreas. They are identifiable by their clothes and their actions. They wear either jeans and a black sleeveless shirt or a white hooded jacket. They stand in the same place for a long period of time and deal to other pedestrians. They carry a Pistol and a large amount of cash. If the player waits around long enough a bodyguard will appear in order to protect the drug dealer. Also sometimes the drug dealer may offer the player drugs. which the player has the option to respond negatively or positively to. If the player responds positively he rejects politely. If the player responds negatively Carl will insult the drug dealer, which may trigger the dealer to open fire on the player. Although not necessarily "criminals", road ragers are also a fairly common sight in San Andreas, particularly in rural areas. If someone crashes into them, they will exit their vehicle and attempt to fight/kill the other driver. Sometimes they will be armed with a melee weapon, such as a Shovel or a Baseball Bat. If they are successful in killing the other driver, they will usually just get back in their car and drive away. Occasionally, a police chase may randomly appear between armed felons in a car and police officers. The armed felons will drive-by the cops during a chase. A police chase may also start if a motorist accidently hits a police car and the police will shoot at the driver. Sometimes an police officer can be seen running after a random NPC (who can be heard screaming and saying things like "I didn't do it!" or "It wasn't me! "), however, unlike Vice City, when the officer catches up to him/her he will then simply walk away. Strangely, the NPC will still run away screaming. Random NPC's may attack an officer for some unknown reason and the officer will take out a pistol and shoot at his attacker. However, the NPC may have a pistol of his/her own. The criminals in GTA Liberty City Stories come in at least two different varieties; one has light skin and wears a grey hooded shirt, a blue jacket and green pants, while the other has dark skin and wears a blue and brown jacket, dark pants and a dark hat. A large amount of them appear in Bedford Point, although they also appear in other parts of the city. 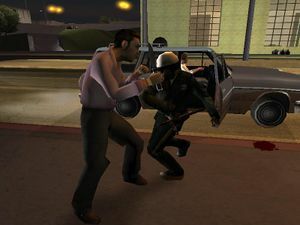 Like in the previous two games, the criminals are often chased by police officers, and the $50 "Good Citizen Bonus" for helping the officer to stop the criminal returns, having been absent in GTA San Andreas. In GTA Vice City Stories, there are no longer any criminals on the streets but the cops will often chase after gang members. However, pedestrians are now much more violent and will most likely attack the player when provoked. The player can get the $50 "Good Citizen Bonus" if they attack any gang member that is under heat of the police. In GTA IV, the police officers are much more vigilant and will try to arrest anyone who commits a crime, including anyone who tries to attack the player. After they have been arrested, the suspect is taken to the the nearest law enforcement vehicle. However, they tend to simply drive around, instead of taking the criminal to the nearest police station. Some criminals may also try to run away while the officer is escorting them to a police car. If the criminal is armed but not aggressive then the police officer will confiscate the weapon and say things like "A concealed weapon huh? Thats another crime to add to your sheet". If the criminal is armed and aggressive they will attack the officers and they will arm themselves and try to kill the criminal. Like in GTA San Andreas, if the player tries to help an officer, they are more likely to attain a wanted level but they can still trip the criminal up and the police will thank the player if done. For some reason if they see a street vendor attacking the player they will not arrest them but instead open fire despite the fact they don't have any weapon. The same thing happens to security guards, bouncers, the security guard at Perseus and the NPC who works at Tw@. Drug dealers also exist in Grand Theft Auto IV, they often operate in less exposed areas such as alleyways and under freeways. They are identifiable by their clothing, consisting of baseball caps and white hooded jackets. Their strange behavior and actions are also a way to identify them. Drug dealers however are usually unarmed, and sell drugs to almost anyone they can find. Unlike drug dealers found during Drug Wars in The Ballad of Gay Tony, unarmed dealers do not retaliate, but flee when threatened with any form of a weapon. The two Los Santos criminals. They are sometimes nicknamed by players as Carjackers. In the GTA III Era they are easy to spot by their style of walking. This page was last modified on 17 September 2016, at 17:14.